Visit the Zoo and parks for free! Check out the Explore Outdoors pass and get free admission for 4 people to the Zoo! Also check out the other unique items available at the Tully Free Library by clicking here. Summer Reading fun for the whole family! Join us for kid, teen and adult Summer Reading and family-friendly performances with the Twin Magicians, Dan the Snakeman, Caricatures by J.P Crangle, and more at the Masonic Lodge in Tully. Find all the info here! All that’s happening in May! Join us in the Padget Community Room at noon and 4 PM for movies from our collection. December 18 - The Hero. Starring Sam Elliott. Check out Cat's Corner, where volunteer Cat Gerson reviews new books in our collection. Rachel Caine's book "Ink and Bone" is this month's recommended read. 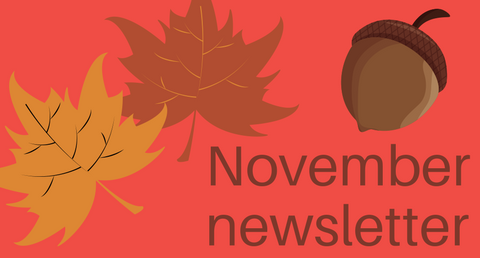 Check out everything that's happening at TFL this month in our November newsletter! Starting Saturday, November 4 from 10 AM to noon, Chess Club is welcoming players of all ages. Families welcome! Whether your are a beginner or an expert, come play and improve your game. Learn tips and tricks and compete with other chess lovers. Eric Godiers will be teaching beignners and coaching those who already play the game. Sue Lehr, local author of Brilliant Bob - My Husband with Alzheimer's disease - our love story, will talk about her book, their lives together, and the stages of Alzheimer’s disease as they experienced it. According to the American Alzheimer’s Association ... more than 5 million Americans have Alzheimer’s Disease. Bob was one of these statistics, but his and Sue’s daily life with Alzheimer’s for over ten years was much more complicated. Brilliant Bob - My Husband with Alzheimer’s Disease - our love story describes what happened as Bob and Sue progressed through the seven stages of this heinous disease for about 10 years before he died in 2014. Sue’s talk will focus on these stages and how they managed to cope, then follow with questions and discussion with the audience. Registration not required. Sign up for an event reminder. Science & Supper Club in Nov & Dec! Join us for our Science & Supper Club, part of the Pushing the Limits book discussion series for adults. A light supper (with vegetarian and gluten free options) will be served. You can pick up a copy of the book at the library. Audiobooks, e-books, and e-audio books are available in the libary system. Pushing the Limits is a reading, viewing, and discussion program for adults in communities served by rural libraries, made possible by a grant from the National Science Foundation. As humans, we often cling to the familiar, and sometimes great dynasties result from children following in their parents’ footsteps. The human body can also benefit from the repetition of familiar motions and routines, creating the physical tradition of muscle memory. We will explore how humans push the limits of tradition with Emily St. John Mandel’s national bestseller Station Eleven and Kari Zhe-Heimerman, Librarian for the Sciences at LeMoyne College. When a global pandemic ends the modern way of life in present-day America, how do traditions like art and culture survive? How are humans driven to transform the world around us, and how do we often transform ourselves in the process? We will explore how humans push the limits of transformation with Hope Jahren’s national bestseller Lab Girl and Sherilyn Smith, Professor of Biology at LeMoyne College. Lab Girl is the fascinating memoir by American geochemist, geobiologist, and professor Hope Jahren. She explores the life cycle of trees, comparing it to her own transformation from a quiet childhood in bleak Minnesota to running a busy lab in Hawaii, weaving in observations on family, friendship, bipolar disorder, and the state of women in science. Lab Girl won the 2016 National Book Critics Circle Award. Take Storytime home with you! We have new kits with books and music CDs that you can borrow for 3 weeks. The two kits were created by the Family Reading Partnership. In the blue tote bag is Read-Along Songs, and in the green tote bag is Read-Along Love Songs for Baby. They are located across from the circulation desk. Purchase of these two kits is thanks to a grant from Senator John DeFrancisco. The library's Book Buggy is now fully stocked with books and magazines for all ages. Stop by to enjoy a book at the beach! Join us for Twilight Zone episodes and trivia! Friday, July 14 from 6:30 - 9:30 PM. 5th grade and up, adults welcome! Pizza will be provided. Jaci Colombo shared these thoughts and pictures with us from last fall. "I have truly enjoyed my vegetable garden. It was a dry year and germination of seeds was poor but with determination I had great yields. Thanks for inspiration with your free seeds." If you would like to share how your seeds are progressing, click here. We have exciting family-friendly programs coming up this summer, including The Twin Magicians, Puppets with Pizazz, The M.O.S.T, and Zoo to You. Also, Monday Movie Matinees, the documentary From the Ashes, kids and teen programs, and much more! The library will be closed on Memorial Day, Monday May 29. We will be holding our annual Pie Sale during the parade. Love to bake? You can donate a pie for our sale. Click here to sign up. Pies can be brought to the library's tent outside on State Street before the parade begins. All proceeds go to support our Summer Reading program. Thank you! What's happening in May? 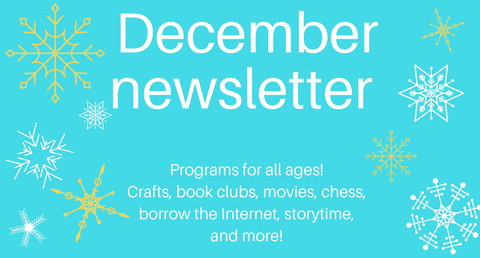 Read our newsletter! Programs and resources for all ages and interests. Monday, May 8 at 6:30 PM join us to meet and have a moderated question and answer session with the Tully Board of Education candidates. Members of the public can submit questions anonymously in the suggestion box at the library circulation desk, or click here to submit a question online. What's happening locally? Now you can follow the calendars of local organizations including the library, Tully Central Schools, Tully Arts Council, Historical Society, and more! Click here to go to the Burbio.com website!